Congratulations on Your 1st Anniversary – How Do You Celebrate? Your first year as a married couple is a special one so be sure to celebrate your first wedding anniversary in style. Congratulations on your first anniversary. Your first year of married life is a special one as you move on from the excitement of the engagement and wedding day and get on with the serious (but still exciting!) business of settling down and making a life together as husband and wife. With this in mind, your first anniversary is certainly a milestone worth celebrating. If you’re stuck for inspiration we’ve got some great ideas to help you celebrate this special day in style. 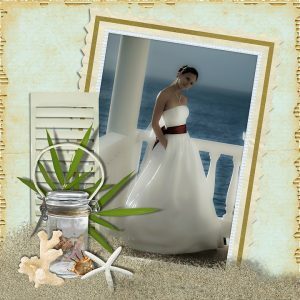 What better way to celebrate your first anniversary than by reliving your wedding day? Spend the day reminiscing, looking at photographs from the day, watching your wedding video, and listening to your wedding playlist. In the evening, cook a romantic candle-lit meal based on your wedding breakfast – and if you stuck with tradition and kept the top tier of your wedding cake, now is the perfect time to eat it, washed down with a glass of bubbly of course! For the first wedding anniversary, the traditional gift is paper. This may not sound as exciting as diamonds, but if you think creatively it’s easy to find a memorable and meaningful paper-based gift for your partner. 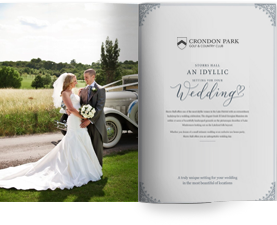 A personalised print, sketch of your wedding outfits, or a book that has a special meaning to you both are all great ideas. Or, if you prefer to buy an experience than an object, buying your partner tickets to see their favourite band or a play that they love will also go down well. We’re all so busy that it can sometimes be difficult to make time for each other. Going on a romantic holiday together to celebrate your first year of wedded bliss offers the perfect opportunity to relax, reconnect and enjoy each other’s company. Chill out together on a white-sand beach, or have fun exploring a foreign city with each other. You could even revisit your honeymoon destination to bring back all those amazing memories. However, if money is tight, a staycation can be just as effective – relax with a spa day, or even see if you can book the bridal suite at your wedding venue. Wedding anniversaries are all about celebrating your life as a couple and showing your appreciation for each other, so push the boat out and be sure to treat your partner. This could be dinner at a fancy restaurant, a piece of jewellery or an expensive bottle of bubbly to share. However, you don’t have to spend a fortune to show your spouse you care. Bringing them breakfast in bed or cooking them a nice meal while they put their feet up can be just as effective. Experiencing new things together can help bring you closer as a couple, and your anniversary is a great time to get out of your comfort zone and try something new. A ride in a hot air balloon or drive in a supercar will get your adrenaline pumping, whereas joining a pottery, life drawing or ballroom dancing class will be sure to give you a giggle and may even help you find a new hobby that you can enjoy together. Whatever kind of activity you try, you’ll be making memories that you can look back on for years to come. Spending time in nature is proven to be good for our physical and mental health so grab your partner and head outdoors. If your anniversary falls on a warm summer’s day you can enjoy a romantic picnic in the countryside (strawberries and champers optional) or a lazy day at the beach. But even if your anniversary falls during the winter you can still enjoy time outside. Try a bracing walk to get the endorphins going, followed by a drink in a cosy country pub next to a roaring fire. On your first anniversary why not head back in time to your very first date. Whether it was a cinema date, romantic meal or just drinks in your local pub, reliving the date is bound to spark happy memories and make you remember why you first fell for each other. Try getting ready and arriving separately to help create those all-important first date butterflies. Your first wedding anniversary is the perfect excuse to splash the cash on a glamorous night out. Whether you book a table at a fancy new restaurant, enjoy cocktails at an upmarket wine bar or bag tickets to a theatre show, taking the time to get dressed up in your finery is sure to make the night feel extra special. If body art is your thing, why not commemorate your first year as a married couple by getting matching tattoos. 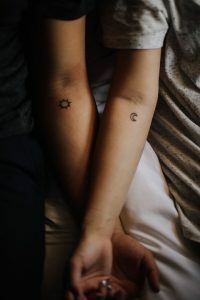 It’s not for everyone, but getting inked in the name of love certainly signifies commitment, and there are some great couple tattoo ideas out there, from small discreet designs to larger pieces that really make a statement. Your first wedding anniversary is very special and you shouldn’t let it pass by without marking the occasion in some way. Whether you prefer a glitzy night out or a quiet romantic night in, there are some great celebration ideas out there. However you decide to celebrate, what’s important is that you make time for each other and show each other how much you care, as you reminisce on your relationship so far and look forward to what the future may bring.